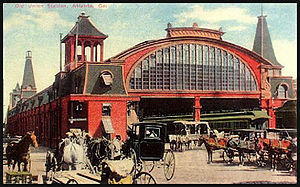 Atlanta's second Union Station was built in 1871 on the site of the 1853 station, burned in mid November 1864 when Federal forces left Atlanta for the March to the Sea. It was built in Second Empire style, designed by architect Max Corput. It was located at what is now Wall Street between Pryor Street and Central Avenue. 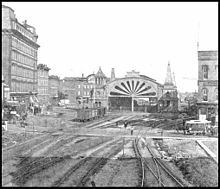 It was replaced by the 1930 Union Station three blocks northwest and one block southwest. As of 2011, a parking structure is located on the site of the 1853 and 1871 stations. Philanthropist Carrie Steele Logan worked at the station as a matron for many years. ^ Minnie L. Perry, "The Carrie Steele Orphanage of Atlanta, Ga." in W. E. B. DuBois, ed., Some Efforts of American Negroes for Their Own Social Betterment (Atlanta University 1898): 60-61. Storey, Steve. "Atlanta Union Station of 1871". Rail Georgia. Cox, Jim (2011). Rails Across Dixie: A History of Passenger Trains in the American South. Jefferson, NC: McFarland. p. 327. ISBN 9780786445288. OCLC 609716000. Caldwell, Wilber W. (2001). The courthouse and the depot: the architecture of hope in an age of despair (first ed.). Macon, Georgia: Mercer University Press. p. 279. ISBN 0-86554-748-3. This page was last edited on 25 February 2018, at 16:17 (UTC).